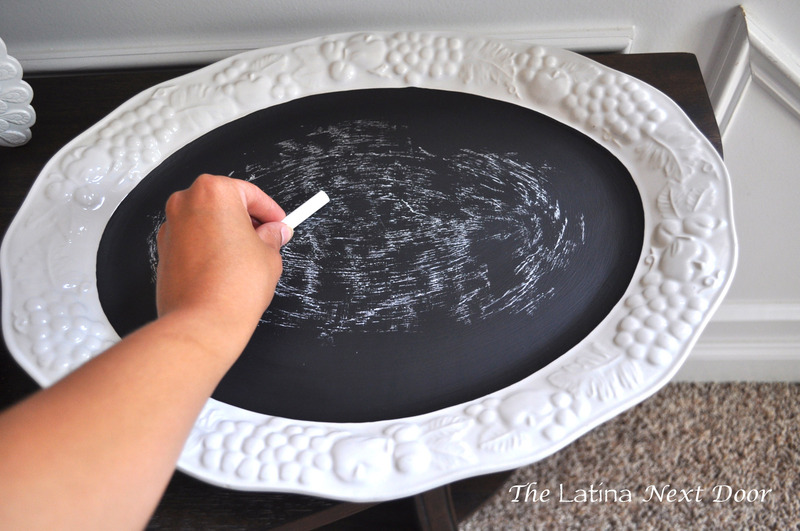 For some time now, I had an idea to turn a serving dish into a chalkboard to have displayed in either the kitchen or dining area. 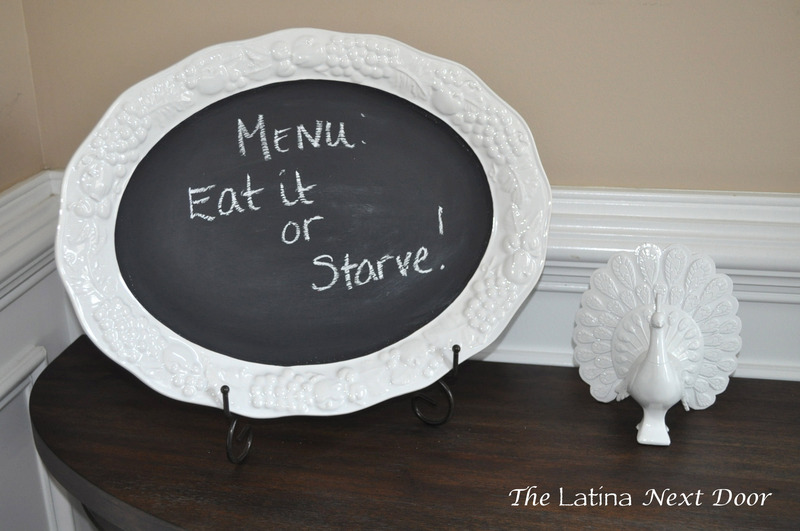 I wanted a place to write the daily menu so when family (my husband at this point and later on, the kids as they get home from school) would know what we were having, no questions asked….. no if’s, and’s, or but’s…… I had been looking for quite some time, but everything I saw was too expensive. 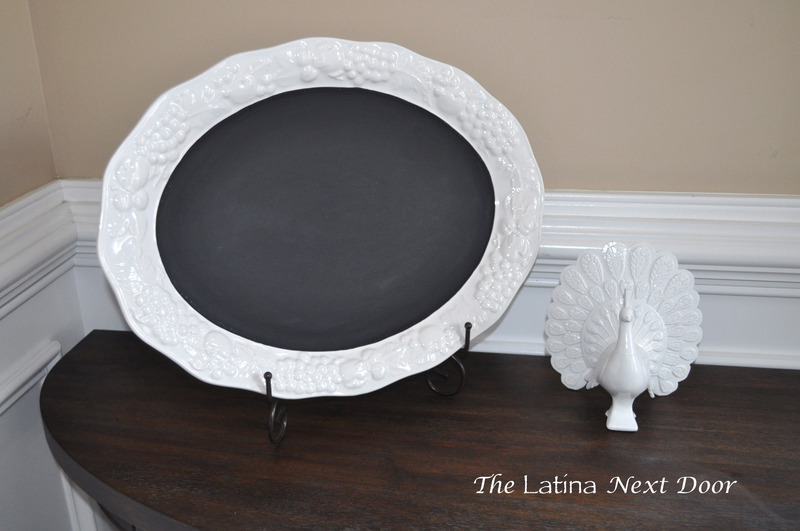 Seriously, if I was going to turn it into a chalkboard, I wanted it to be super inexpensive. One day I decided to check out our local Goodwill and you will NEVER guess what I found! Okay, maybe you will. It was like the heavens knew exactly what I was looking for and led me there! And at only $2.92 it was a no-brainer. It was the perfect size and already white which is how I wanted to keep it. I cleaned it with soap and water and it looked brand new. 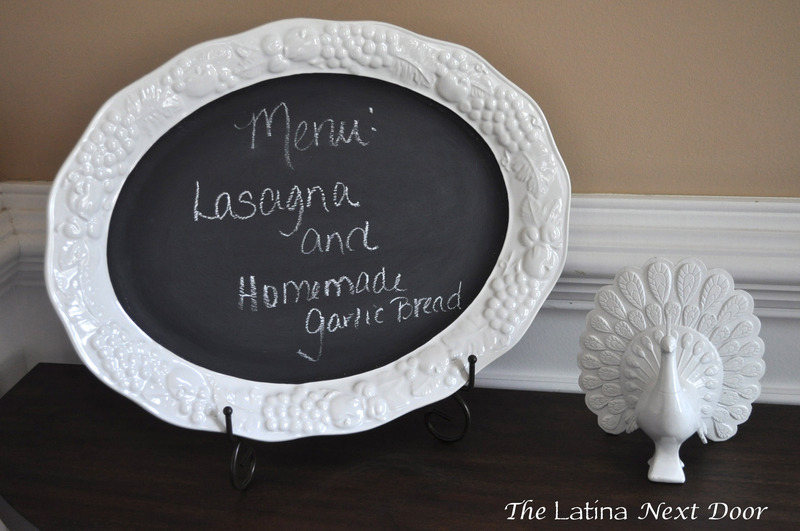 I took out the chalk paint that I already had on hand and used on these wine glasses here. 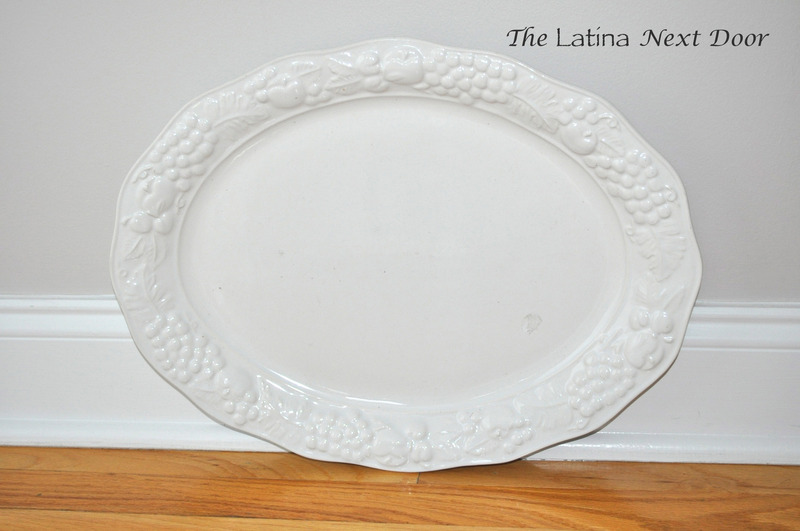 I sanded the inside of the plate where I was going to paint with a fine (I believe a 180 grit) sanding block. All I needed was for the “shiny” to go away. Then I just used a small foam brush and painted my little heart away! I gave it a good 4 coats letting them completely dry in between. Note, before you could use the chalkboard you have to let it dry for about 3 days and before you can write on it you have to “cure” it by sliding a chalk piece on its side all over the painted area, then wiping it off. This helps the writing erase easier. 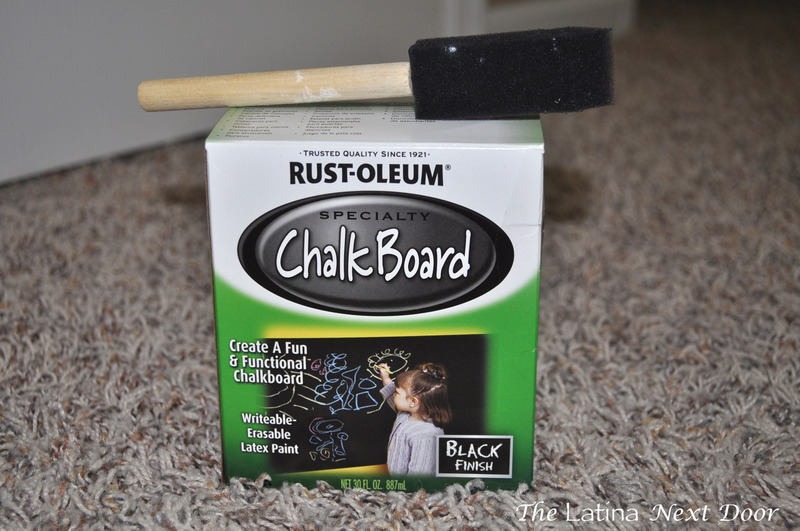 So I “chalked”…. And then I wiped the excess off…. Below is the finished “cured” product. I may want to hang it, but for now I have it standing on a plate stand on the side table in the dining room and it looks adorable I think. Below is what it looks like with writing on it. Either way, I loved how it turned out. I think this is a great way to update an old dish you no longer use or that wedding gift you got and never used cause it was, ya know, just not your style but you couldn’t return it. 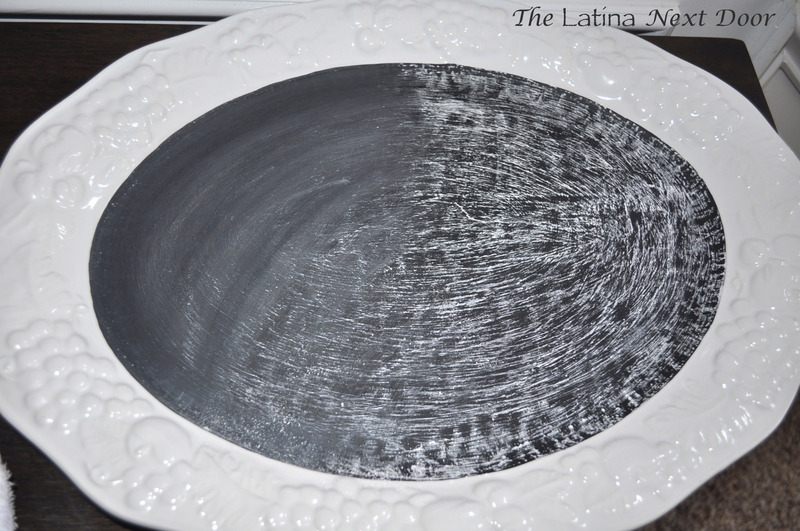 You can always spray paint the edges a nice bright color before you chalk paint it for a more vibrant look. I wonder what else I might change up! This could also make a great gift idea!